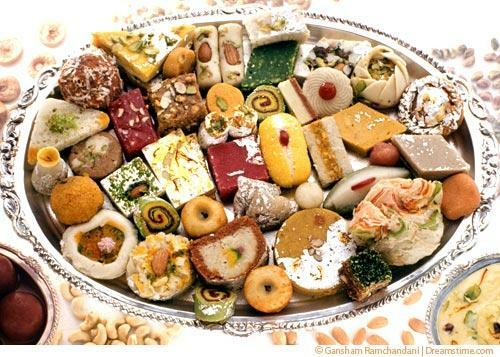 Bengal is the home of Indian sweet manufacturing and of all Bengali sweets, sandesh is the most famous. It is prepared from only two ingredients: paneer (homemade curd cheese) and sugar. Use one-quarter part sugar to the volume of kneaded cheese curd. Sandesh is very simple to make, provided you prepare the curd cheese properly. You should also knead your cheese to the correct silky-smooth, neither-wet-nor-dry texture. Sandesh must be cooked in a scrupulously clean pan over very low heat. This sandesh derives its lemon flavour from the lemon oil contained in lemon rind, which is added during, and removed after, cooking. Knead and bray the paneer (curd cheese) on a clean surface until it is silky smooth and creamy. Gather into one lump and calculate its volume with measuring cups. Measure one-quarter that volume of sugar. Combine the cheese, sugar, and lemon rind and again briefly knead and bray the cheese. Place a heavy-bottomed pan on the lowest possible heat and, constantly stirring with a wooden spoon cook the cheese for 10 to 15 minutes or until its surface becomes glossy and its texture slightly thickens. Scrape the sandesh from the pan and remove the lemon rind. Press the sandesh onto a lightly buttered tray into a flat 1.25cm (1/2 inch) squares. Cool to room temperature. Cut the cake into 2.5 cm (1-inch) squares. When completely cool, store in an airtight container in a single layer. The sandesh can be refrigerated for up to 4 days. Submitted by Ansie (not verified) on Tue, 05/31/2011 - 02:57.
i've really enjoyed looking at all recipes - they are ALL mouth watering. I simply love paneer makani - i'm always ordering it at Govinda's restaurant, Phoenix, Durban, South AFrica - simply divine. Please,please can you send me the recipe on how to make it.